It takes hard work and persistence to succeed in the competitive industry of graphic design. That’s good news for Koby Hyde. It’s good news, because you’d be hard pressed to find a young man who knows more about hard work and persistence than he does. This rising artist had to start life over with a blank canvas at the age of 15 on March 2, 2013, when a car wreck resulted in the type of traumatic brain injury referred to as diffused axonal. In a coma for seven days, Koby opened his eyes to a new and demanding world a short while after his home community in Powell finished a prayer vigil on his behalf. For seven days he had lain motionless in a hospital bed, kept alive with a feeding tube and a tracheotomy. By the end of two weeks, he had lost about 30 pounds. Koby entered Patricia Neal Rehabilitation Center unable to walk and unable to remember much of anything. He had lost the ability to catch a ball or draw a picture, so the two things he loved the most – sports and art – had been forcibly removed from his life. But from the first day at PNRC, Koby was faced with a choice. He could choose to let the sadness of the situation overwhelm him, or he could choose to work on regaining his abilities with the help of highly trained rehabilitation experts, and that’s what he did. For eight hours every day, therapists worked with Koby, teaching him to walk, work, play and learn, and to remember. At the end of every session he would return to his room and collapse on his bed. 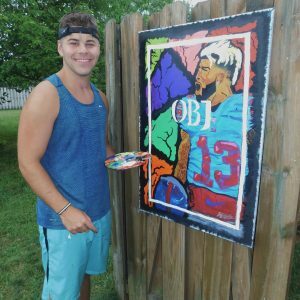 After being discharged, Koby continued therapy on an outpatient basis and began to apply the same determination to sports and art. It wasn’t easy. As a matter of fact, it was discouraging. Koby still remembers how sad he was the first time he tried to create a picture and discovered he couldn’t make his hands draw the image in his mind. Still, he never gave up. Once released from therapy, Koby continued to work tirelessly to become stronger and more coordinated. It was a slow and sometimes grueling process, but he never gave up. Three months after a horrific car crash that left his son in a coma and three months after being told by a doctor that Koby would only be able to do about half as much as before. Brian Hyde watched his son take on the role of designated hitter for the Powell High School baseball team. As for Koby’s artistic ability, you only need to take a look at his painting to know he’s regained that, too. He is currently pursuing an associate’s degree in graphic design from Pellissippi State Community College, after which he plans to earn a bachelor’s degree at the University of Tennessee. Koby still has one of the hundreds of bracelets that were made and distributed in his community while he was hospitalized in a coma. It bears his initials and the number he wore on his jersey. The support he experienced from his community, his family and the staff at PNRC has been overwhelming at times, as is the knowledge that his life could be very different today.